Effective marketing is crucial when it comes to taking your business to the next level. That is why the Chamber continues to stay up to date with the most current and effective marketing techniques available so we can help you get the traffic you desire. Here at the Chamber, we offer a wide range of advertising opportunities designed to fit any budget so you can do just that. Because we only offer these advertisement options to our members, you have the exclusive opportunity to stand out in the community and connect with other leading businesses in the area. The Bay Biz magazine is “the voice of businesses from the Bay County Chamber.” The publication has a circulation of over 4,000 copies, is printed quarterly, mailed to members, and delivered to various regional businesses. It is also available at Chamber events and can be viewed on our website and social media accounts. The Bay Biz includes topics such as Political Perspective, Defense Intel, Health, Technology, and more. *Multiple issue discounts available. Contact Taylor Smith, Vice-President of Communications at 850.215.3755 or at Taylor@BayChamberFL.com for more information. The e-Biz newsletter is emailed bi-weekly to over 3,000 Chamber members. The e-Biz keeps the membership informed about Chamber and community related information such as events, new businesses, grand openings, groundbreakings and more. Members can advertise in the e-Biz by purchasing a side-bar ad that can be linked to their website or flyer. One month of e-Biz Ads (2 ads) may be purchased for $100. Published annually, this guide is packed with valuable information about Bay County and all municipalities to assist individuals, families and businesses making a move to our area. It has a circulation of 10,000 printed copies; is available on the Chamber’s Website; is emailed to over 3,100 individuals; and is shared on the Chamber’s Facebook, Instagram, Twitter and LinkedIn Pages. The deadline to submit your contract for the 2019 edition of this publication is November 30, 2018. The Chamber website is a resource of interactive information for our members including a member directory, community and Chamber calendars, Internship Marketplace, Member to Member Discounts, job postings, and more. Put your business in the spotlight with a banner, column ad or an “enhanced” listing package on the Chamber’s high traffic web pages. The site receives thousands of visits each month from users looking for products and services in Bay County. This advertising program allows Chamber members to include their valuable business information in the relocation packet that is mailed to individuals and businesses looking to relocate to Bay County. Various levels of participation are available, allowing for different types of promotional material to be included in the packet. Make your business stand out to the thousands of visitors to the Bay County Chamber of Commerce through our stunning, high-resolution digital display. The display is the main feature of the Chamber Lobby, not only displaying your advertisement, but holding brochures, magazines and other information from our members. Each advertisement will receive 80 impressions per hour and may be updated as many times as needed throughout the year. The annual price for one ad is $350. Ads for the digital billboard should be 1920 px X 1080 px at 72 ppi. No application files will be accepted. All color spaces for bleed (print) ads must be process (CMYK). No RGB, LAB, spot colors, or embedded ICC profiles accepted. All bitmap/raster elements must be at a resolution of 300 dpi. All files should have marks indicating trim and bleed. All marks must be outside the trim and bleed area of the document. All color spaces for non-bleed (digital) ads must be RGB. No CMYK, LAB, spot colors, or embedded ICC profiles accepted. All bitmap/raster elements must be at a resolution of 70 ppi. Ad must have a continuous border. Ad must follow standard IAB Guidelines. The Bay County Chamber of Commerce will not be held responsible for errors in reproduction if files are submitted incorrectly as pertaining to the advertising guidelines. No liability is assumed for reproduction quality of any material received after the ad closing date listed on our production schedule. Charges will apply for any production work necessary to create a press-ready file. These charges will be billed to the client. The contents of advertisements are subject to the publisher’s approval. The publisher reserves the right to reject or cancel any advertisement, insertion order, space reservation or position commitment at any time. Publisher shall not be liable for any costs or damages if, for any reason, publisher fails to publish an ad for errors in ad placement. No cancellations of space will be accepted after the closing date. 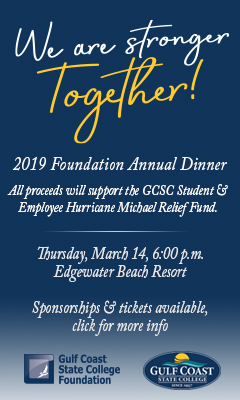 For more information, please contact Taylor Smith, Vice President of Communications at 850.215.3755 or at Taylor@BayChamberFL.com.